What a wonderful love story. If you are new to Kit Roche or a fan this story captures your heart and soul. 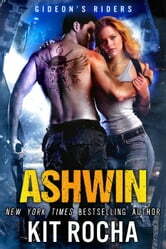 Ashwin the strong soldier who's only weakness is his love for Kora. Kora's weakness is the love she has for a soldier. You can't help but fall in love as they struggle to help each other to realize how strong their love is. You will not be able to put the book down until the end and then you will search for the next Rider story. For the riders are a group of strong men that you will want to see fall in love and meet the strong women who can bring them to their knees. **I received an ARC in exchange for my HONEST opinion for this book** I have been waiting to hear Ashwin's story ever since he first made an appearance in the O'Kane world of Kit Rocha's previous BEYOND series, and let me tell you, this book did not disappoint!! As an introduction book to a new series, Rocha gives a great background for both new and returning readers, while delivering a spectacular story line full of steamy moments, page turning drama, and enough characters in the background to keep us coming back for the rest of the series!! As far as Ashwin and Kora... it's about time that they get their moment in the spotlight!! And what a moment it was... an unfeeling solider and a woman who does nothing but feel... can they make it work or will they continue to do nothing but hurt each other?? I couldn't put this book down. Amazing. I can't wait to meet the rest of Sector One!!! I really enjoyed reading, Ashwin. It was an interesting concept with lots of interesting characters. I am glad I was introduced to this series. Can’t wait to read the next book and see what happens next!